Yep, you read that right. We’re giving away FREE BEER! Our TGI Friday – FREE BEER FRIDAY offer starts on the 5th April!!! 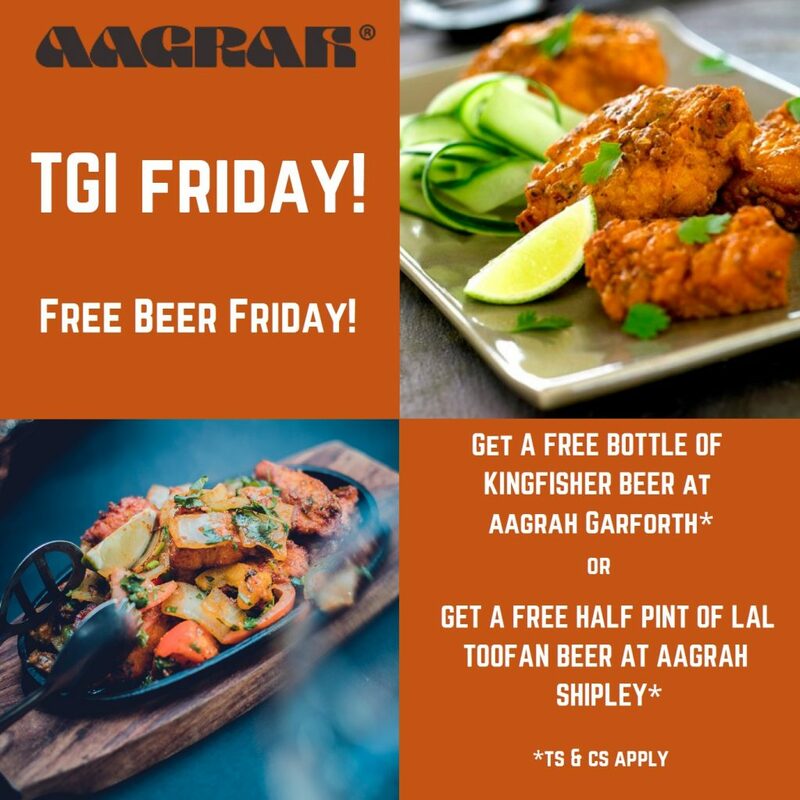 We’re giving our customers a FREE bottle of Kingfisher Beer at Aagrah Garforth or a FREE half pint of Lal Toofan at Aagrah Shipley on Fri 5th, 12th & 19th April *(see full terms & conditions below). This limited time offer is EXCLUSIVELY available at Aagrah Garforth & Shipley. We’re certain that this offer will prove popular so BOOK NOW to reserve your table! Offer only valid on Fri 5th, 12th & 19th April 2019. Offer valid for in house evening dining only. 1 bottle (330ml) of Kingfisher Beer will be provided at Aagrah Garforth. One half pint of Lal Toofan will be provided at Aagrah Shipley. One bottle or one half pint will be provided per person, per order whilst stocks last. Minimum order of £15 is required. The management reserves the right to refuse, withdraw or decline this offer at any point without notice and without compensation. In any case of dispute, the management’s decision is final.